Bernie Sanders’s recent comments on open borders played into a right-wing trap. But his strong record on immigration suggests he can advance a program for immigrant rights that sees immigrants as key players in winning a society for the many, not the few. Asked why he supported “open borders” at a recent Iowa town hall, Bernie Sanders responded that he did not. Liberal critics to Bernie’s right cynically frame comments like this one as evidence of his lack of commitment to racial justice. This is absurd: Bernie has a far better record on, and program for, racial justice than members of the Democratic establishment. 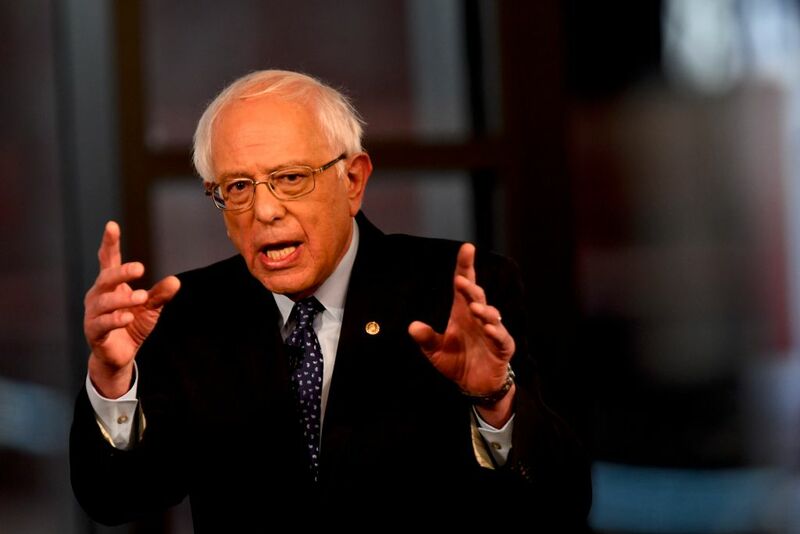 Bernie does, however, sometimes fail to connect the dots between his marquee economic agenda and his racial justice program. His decrying “open borders” was a case in point: the comment was politically unnecessary, played into a right-wing nativist trap, and misconstrued the political economy of migration. Bernie’s track record on immigration is strong. But he currently lacks a bold vision for immigrant justice that identifies an immigrant-dense working class as a protagonist for progressive social and economic transformation today, matching the clear and compelling framing he uses to talk about issues like economic inequality. Luckily, Sanders’s track record suggests he can avoid the trap the Right wants to set for him on immigration and advance a vision of immigrant rights that expands and strengthens his call for a society for the many, not the few. The first thing Bernie and other left politicians must understand is that the Right wants to define the immigration and border debate by the question of “open borders.” The sudden insistence that any politician left of Attila the Hun answer the question of whether they support open borders or not is a ploy to make any reform to today’s brutal immigration status quo seem impossible. Left politicians should refuse to take the bait. Unfortunately, Bernie articulated his opposition to “open borders” using language that legitimates false and dangerous right-wing nativist talking points. While he suggests a social-democratic rationale to that opposition (that we can’t support a welfare state and high wages if American taxpayers must fund programs for the world’s poor and if American workers must compete against poor immigrants), his rhetoric actually echoes a long-standing xenophobic argument that the world’s huddled masses will swamp our economy the moment we blink on border vigilance. That contradictory argument, that migrants pose a simultaneous fiscal and labor market threat (too lazy to work so they’ll mooch off welfare, yet so good at working for so little that they’ll bid wages down), has long been a key nativist-right argument. It draws on a form of balanced-budget xenophobia that was central to the new nativist movement’s breakout in 1990s California, as well as that era’s broader, racist demonization of welfare. Bernie supports working-class unity and a robust welfare state. He should avoid language that suggests otherwise. What’s more, by suggesting that immigration exclusion functions to control immigration for the native-born working class’s benefit, Bernie mischaracterizes the political economy of migration. For example, immigration flows from Mexico, which have for decades defined American immigration politics, have never been primarily shaped by any purported lack of border enforcement, but rather by political-economic realities in both countries. But sociologist Douglas Massey and his colleagues have found that border militarization did cause a perverse “caging effect,” which persuaded migrants who otherwise would have stayed a short time in the United States before returning to Mexico to actually stay put in the US — thus increasing the undocumented population. In other words, border enforcement has likely functioned more as a cause of undocumented immigration than a deterrent against it. In 2015, Bernie deservedly caught flack for calling open borders a “Koch brothers proposal.” In reality, throughout the history of American capitalism, capital has never favored “open borders.” Business has always pushed for forms of migration that combined exclusion and oppression to create a labor caste system designed to increase profits by weakening immigrant-worker power — and thus the power of the working class as a whole. Black Africans were coercively migrated as enslaved laborers; roughly 250,000 Chinese migrant laborers came to work in the West until the passage of the Chinese Exclusion Act of 1882. In the early twentieth century, recruiters enticed Mexican workers into a system akin to indentured servitude in the United States known as el enganche, “the hook,” exploiting Mexicans’ labor as part of a system that also subjected Mexicans to segregation, discrimination, and rampant state and vigilante violence; millions more Mexican workers were recruited to work in the brutally exploitative Bracero guest-worker program after the door was shut to more Asians and to Eastern and Southern Europeans in the early twentieth century. In the 1960s, after the Bracero program was shuttered, Mexicans, documented and not, continued to labor in the US, their racialized second-class caste status exploited for profit. For capitalists, the border can’t be open, but must function as a sieve that sorts workers into more or less favored categories in a segmented labor market to more effectively exploit them all — while simultaneously creating a useful scapegoat for the misery that capital imposes. NAFTA, for example, was accompanied by a massive crackdown on “illegal immigration.” Rahm Emanuel put it clearly to President Bill Clinton in a 1996 memo: the US had to crack down on “illegal immigrants” to quiet opposition to free trade. “We should be honest, that if we want continued public support for trade and friendly relations with Mexico, we must be vigilant in our effort to curb illegal trade (e.g. narcotics and immigrants).” The hardening of borders for people and opening of borders for capital is functional and by design. There are no doubt libertarian calls for “open borders” emanating from the Cato Institute. But empirically, capital and the politicians who represent its power in Washington have consistently built racist immigration systems that divide the working class. By contrast, immigrant workers have been at the forefront of labor struggles: Haymarket in 1886; the 1912 Bread and Roses textile strike in Lawrence, Massachusetts; cross-border unity between the Industrial Workers of the World and Mexican revolutionary Magonistas; the Congress of Industrial Organizations’ (CIO) organization of millions of Southern and Eastern European immigrant and black workers into a militant, striking fighting force; Los Angeles’ Justice for Janitors campaign in 1990; the mass immigrant rights protests on May Day 2006 that transformed American immigration politics forever, and the Fight for $15 waged in significant part by immigrant service workers. Similarly, from the Haymarket trials and the First Red Scare to the Republican Revolution of 1994, the Tea Party, and now Trumpism, the Right’s anti-immigrant attacks have gone hand in hand with attacks on the entire working class. Bernie must conceive of immigrant rights as workers’ rights, breaking with a dominant liberal moralism that appeals to sympathy with immigrant victims instead of calling for solidarity with immigrant workers. The standard liberal framework that the American economy “needs immigrant workers to do jobs that no one else wants to do” feeds directly into Bannonite anti-migrant nationalism. The Left’s message isn’t that capitalists need more immigrant workers but that the labor movement needs more immigrant worker militants. Laudably, Bernie has started to connect the dots, supporting visas for worker whistleblowers who call out labor abuses. But he must do more, particularly as Trump seems poised to accelerate mass raids on immigrants in their workplace ahead of the 2020 election. Last night, Bernie’s generally masterful performance at a Fox News town hall included discussion of the border and immigration. His rhetoric was mixed. On the one hand, he rightly emphasized the dire conditions of “violence and misery” that Central Americans migrants flee and warned that a failure to confront climate change would force massive numbers of people from their homes. But his proposed solutions were vague, and he returned to his standard call for “comprehensive immigration reform,” a phrase that either means nothing or, worse, refers to the legislative framework combining legalization, enforcement, and guestworker programs that repeatedly failed to become law under Bush and Obama. CIR is not only a morally odious tradeoff but one that is premised on winning over Republicans who will never vote for legalization — ever. And Sanders also argued that there were more “cost-effective” solutions than the wall, saying: “We need border security, of course we do — who argues with that?” Well, me and a lot of immigrant rights activists. I wrote an op-ed recently literally called “The Case Against Border Security,” arguing that Democrats must stop describing immigration as a “security” issue because it reaffirms a right-wing nativist framework for interpreting immigration. Bernie has to talk about immigration differently on the campaign trail. But we shouldn’t confuse his record on this point: Sanders is easily the Democratic primary candidate with the strongest record on immigration. First, the imperfect: he inexplicably voted for a 2006 bill that allowed for the indefinite detention “of specified dangerous aliens” awaiting a final ruling on their deportation. The legislation, as the ACLU put it, “would broaden” a “constitutionally dubious practice.” And that same year, he voted to block the US government from sharing intelligence on Minutemen vigilantes with Mexico. Neither of these votes — the former, legislation that died in the Senate, and the latter purely if toxically symbolic — has been satisfactorily explained. Bernie should say that both votes were a mistake. Far more importantly, however, Sanders has mostly voted correctly on the major legislation that has defined immigration politics since he first entered the House. He voted against 2006 Secure Fence Act to build hundreds of miles of border wall — unlike Obama, Clinton, and Biden, when the bill came to the Senate. He voted against a 2007 “reform bill” that included legalization for undocumented workers but also harsh enforcement and a guest-worker program. It was supported by mainstream immigrant rights groups but opposed by the left grassroots movement. In 2013, however, he voted in favor of similar legislation, falling in line behind mainstream immigrant rights groups and the Obama White House. He voted against the 1996 Antiterrorism and Effective Death Penalty Act, which greatly expanded government power to detain and deport. And perhaps most importantly of all, he was one of just eighty-seven House members to vote “no” on the catastrophic Illegal Immigration Reform and Immigrant Responsibility Act (IIRIRA), which firmly linked the deportation machinery to the system of mass incarceration. Bernie is also the only candidate with an economic and foreign policy agenda consonant with substantive support for immigrant rights. Beto O’Rourke’s rhetoric on the border has been stronger — it’s where Beto is from, and he clearly understands the harm caused by militarization, something that I interviewed him about in 2016. And Beto is notable for calling border militarization by its name. Julián Castro has recently called for the decriminalization of “illegal entry,” the federal misdemeanor that Trump has used to separate families. I called on left politicians to do just that in February; Castro should be commended for doing just that. Castro has also set a high bar in calling for an end to cooperation agreements between ICE and local law enforcement, the latter of which has become the starting point for the deportation pipeline. But border and immigration politics can’t be approached as stand-alone issues, apart from a larger political vision: immigrant rights are workers’ rights, and so support for organized labor is indispensable for evaluating a candidate on immigration. Likewise, support for immigrants must be accompanied by an insistence on changing a foreign policy and global political economy that forces people from their homes and violates their right to stay put, which is a fundamental corollary to the freedom of movement. Support for immigrants must also include a bold agenda to combat climate change, which is already fomenting mass migration from Central America. Bernie is the only candidate who can challenge US empire and the fossil-fueled global financial system that produced mass forced migration and hardening borders that are at the root of today’s migration crisis. Bernie doesn’t need to come out for “open borders.” I support open borders and the unfettered transnational free movement of people, but I don’t think it should be a litmus test for our support. (I also support worker control of the means of production but don’t think that Bernie should call for that — not yet, anyway.) We should demand that Bernie speak clearly in favor of demilitarizing and making the border more open so as to radically increase the government’s respect for the human right to mobility. That would include tearing down the hundreds of miles of border wall that already exists, dramatically downsizing the Border Patrol, and using those savings to address the humanitarian crisis at the border; ensuring that the right to asylum is respected for those fleeing not only state repression but also climate chaos and domestic and gang violence; and decriminalizing immigration enforcement by, for example, repealing laws that make illegal entry a misdemeanor and illegal reentry a felony. Castro’s program isn’t a bad place to start, as it’s strong on these issues. The good news is that Bernie is well positioned to do all of this, given his track record of moving the national debate leftward generally and his strong voting record on immigration, breaking from the Democratic establishment to vote against harsh border enforcement and immigrant-criminalization measures during the long era when doing so was politically dangerous. The “open borders” question is often a misleading one, because it presupposes that there are only two options: either zero border controls or today’s dystopian reality of border militarization. But Bernie can demand a more open border without demanding “open borders” now. When Bernie is asked about open borders, his response should be something like this: “Wrong question. In the last three decades, we have nearly quintupled the size of our Border Patrol and built hundreds of miles of border wall — a measure, by the way, that I voted against in 2006. In doing so, we have militarized the border beyond recognition, which has caused thousands of migrant deaths in the desert and harmed millions in borderlands communities — people who have told me that they don’t want to live in a police state, and don’t want to be cut off from their Mexican sister cities to which they have such deep, long-standing ties. We have Trump today in part because we have had decades of scapegoating undocumented immigrants for the harms caused by an economy and government controlled by the 1 percent for their exclusive benefit. “The crisis at the border today is a humanitarian one, especially impacting Central Americans. We must demilitarize the border and ensure that it is open to asylum seekers fleeing economic devastation and violence — a situation created by our country’s dreadful policies in Central America and, increasingly, the realities of global warming. “Mexico is our next-door neighbor. It is immoral and hypocritical to suddenly say that Mexicans, our neighbors, are not welcome here — especially since US business has long relied on recruiting and exploiting Mexican migrant labor. People say that Mexicans should come legally. Do you know how many years a Mexican relative of US citizen has to wait to do that? Mexicans need legal ways to migrate so they can reunite with their families. Trump’s 2020 campaign will be laser-focused on pushing virulent and racist anti-immigrant rhetoric. The Democratic nominee cannot hide from that fight. It’s urgent that Bernie recruit a left immigrant rights brain trust to formulate a vibrant and coherent strategy that can both take on Trump and surpass the establishment liberal immigrant rights framework that has for decades utterly failed to advance immigrant rights. This isn’t just naive idealism: Americans today hold perhaps the most pro-immigrant opinions in US history, thanks in part to growing partisan polarization on the issue that has accelerated under Trump. It’s thus the task of left politicians to not only follow but to lead. Sanders’s 2020 campaign slogan is “not me, us.” A robust program and strong rhetoric on immigrant rights is necessary for Bernie to ensure that “us” refers to the entirety: the task is to stand with immigrants as they fight at the lead of the working class.